Time to see if you have the luck of the Irish with you, because Boku Slots would like to take you on a trip over to Emerald Isle Slots. 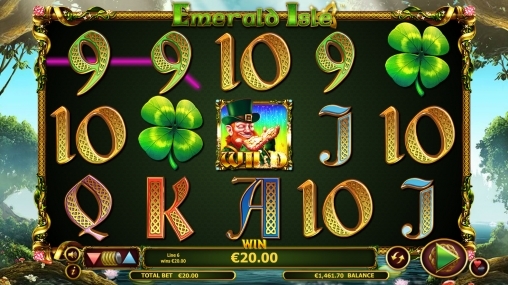 Nextgen Gaming has created an elegant and luxurious looking slot that the leprechauns would be proud of. Emerald Isle is a 5-reel, 20 fixed pay line slot game that offers an RTP of 96.59% to its players. The backdrop is an almost mythical looking forest, somewhere you’d think those lucky leprechauns would live. The images are lush and exude wealth from every little gilt-edged symbol, to the pots of gold, rainbows and clovers. Bet Amounts – Betting begins on Emerald Isle at 20p per spin, which is just 1p per pay line in play. This can be adjusted by using the little coin switches in the bar at the bottom of the screen. The maximum bet amount is £200 making it £10 per pay line. Always ensure you have adjusted the bet amount, as once you have hit spin the money is gone. Wild Symbol – The wild symbol is none other than the lucky leprechaun himself. He substitutes for all other symbols except the rainbow scatter and he is also the highest paying symbol too. Land 5 of these on an active pay line and you will win 6,000 coins. Scatter Symbol – In keeping with the lucky Irish theme your scatter is the rainbow, but will the pot of gold be at the end of it? Land three or more of the scatter symbols in succession and you will trigger the bonus spins. In addition, for every 2 or more scatter symbols that land, there are the scatter wins awarded on top of any pay line win. Bonus Spins Feature – Having landed 3 rainbow scatters in succession, you will be allocated with 10 bonus spins. All prizes within this round are tripled and the spins can be retriggered as well. Leprechaun Bonus Round – To trigger this game you need to land the leprechaun wild on reels 1 and 5 at the same time. There will then be a choice of treasure chests on the screen, which you need to choose from. The aim is to reveal two matching amounts which then become your prize. There is a massive 500x multiplier in these chests, so it can prove to be a very fruitful round. 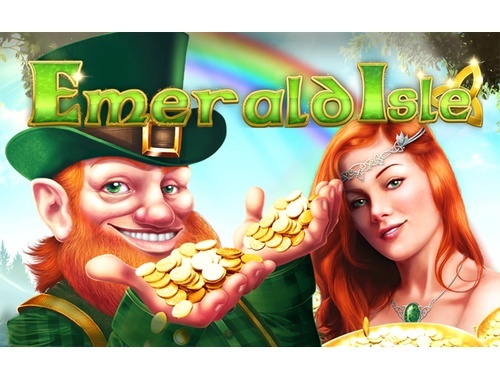 Gamble Feature – Emerald Isle offers its players the chance to gamble on each win. Just select the club and heart button at the bottom of the screen to do so. You will be faced with a card and the choice of either guessing its colour or suit. Guess correctly and you can either double or quadruple your win. Guess incorrectly and you lose it all, so be very sure you want to do this before you start. Emerald Isle has a lot to offer, making it very popular with new and experienced players alike. The soundtrack is stunning until you win and then it’s broken by a raucous noise, however this signifies you winning so we can live with it. Our advice is to switch off the sound and pop on a nice Irish themed cd in the background instead. Aside from that we really enjoyed our time frolicking in the clover and we took quite a few wins away as well, which is always a bonus.